(Serial No. 2234) Excellent repaired condition. Peter Mix and Pete Langdell formed up Rigel Instruments to build some unconventional mandolins. 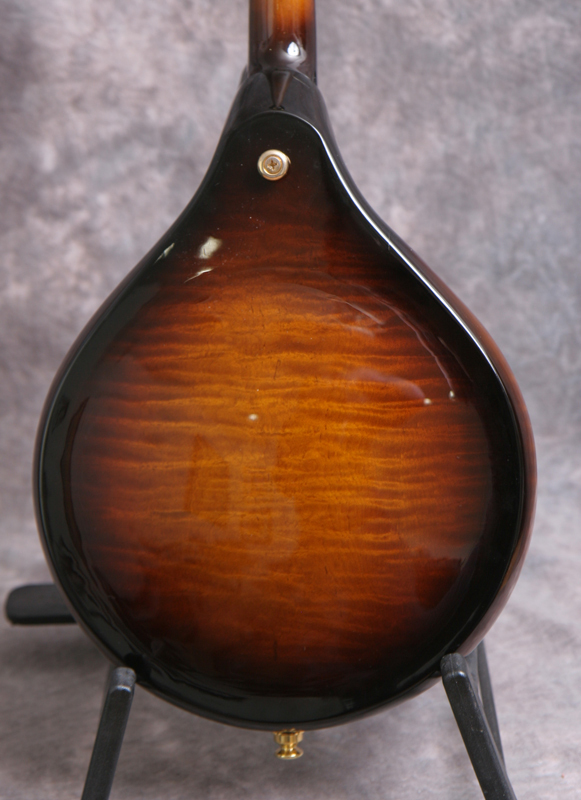 The appearance is of a A5 style mandolin; but the sides are carved from a single block of Vermont sugar maple. The highly figured maple back and the carved and tap tuned spruce top are invisibly melded together to form a seamless body contour. The ebony fretboard is radiused and has been scooped to eliminate pick click, and the bone nut is 1 1/8 inch. The maple neck is reinforced with a carbon fiber rod so it will never bend; in fact, the neck relief is carved into the neck at the time of manufacture. 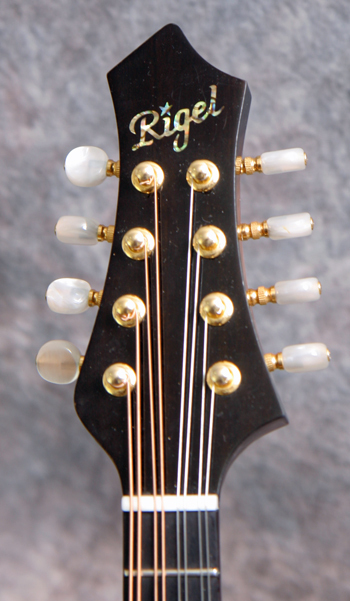 Has gold Grover tuners and a gold Rigel one-piece tailpiece. 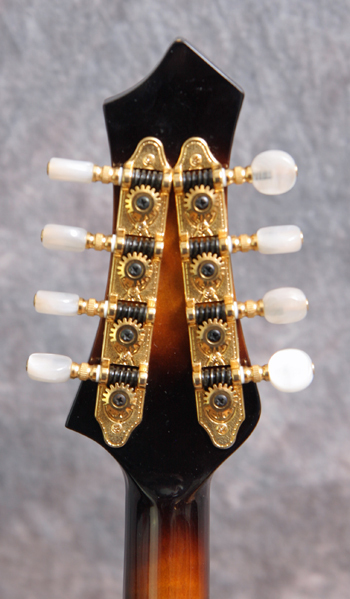 The mandolin is fitted with a piezo pickup and endpin jack from the builder. The logo and fretboard dots are pearl. 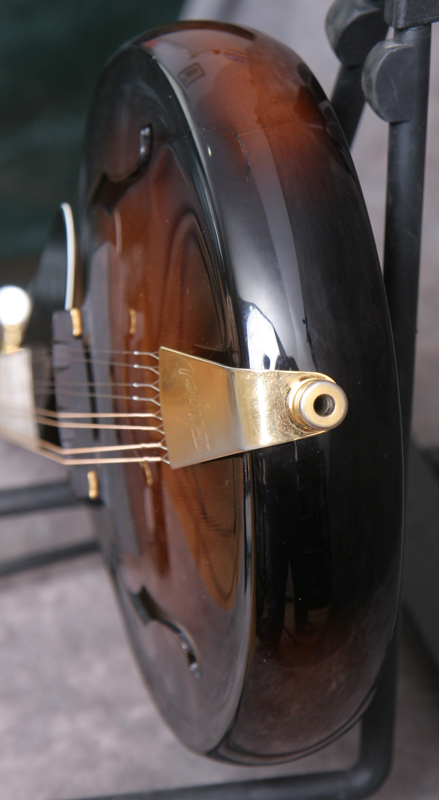 There was a crack at the lower treble F hole that has been professionally repaired and is nearly invisible, and the mandolin is fitted with a Dotson bridge. Despite the unconventional apprearance, this is a very versitale and good sounding mandolin. 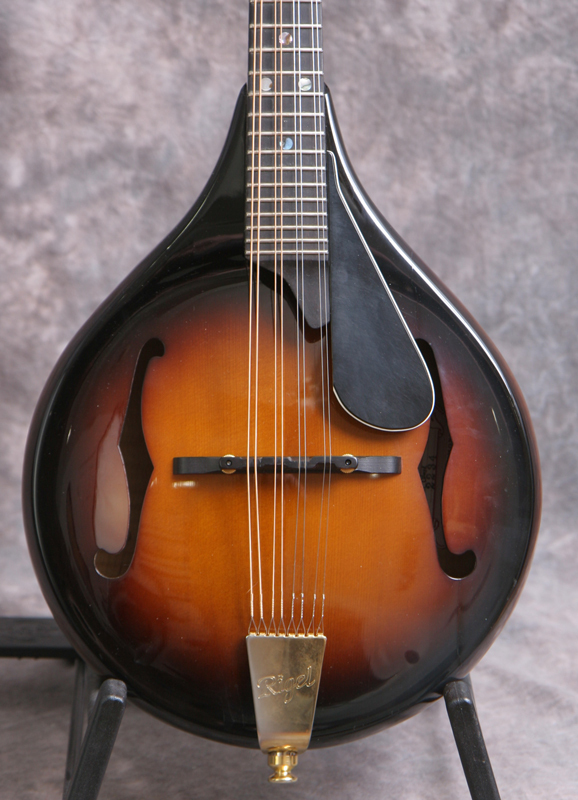 Has the wonderful rich, complex silky tone that Rigel mandolins are famous for, but it can drive your bluegrass band with strong chop and bark no problem. Here is a short video clip of this instrument played by Richie Dotson, who did the beautiful repair work and setup. Comes with the original tweed hardshell case.